Sometimes the random photos are more intriguing than those I have set out to shoot. Every morning for two weeks, I climbed the stairs leading to the second floor classrooms at the Columbus College of Art and Design. The door opens onto a sunny landing with tall windows. Each time, a roving herd of snazzy turquoise-seated chairs greeted me as I headed toward the QSDS office. 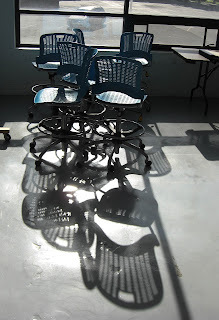 The metal frames and openwork seats of those chairs threw intriguing shadows onto the concrete floor. The patterns varied, determined by the positions of the chairs. This is my favorite photo. Symposium attendees have drawn and stitched chair portraits and taken crayon rubbings of their backs. Chairs as inspiration.